A new microbrewery – Roath Brewery – launches this weekend, selling its beers at the Roath Farmers’ Market. The brewery’s range of beers are all inspired by the people and places of Roath. Set up by Roath locals Tom Lyons and Matt Appleby*, this weekend’s launch comes after a year of working on recipes and setting up the small brewhouse. To start with the beers will be sold from the market every week but the pair hope to sell from shops, restaurants and bars in the coming months. 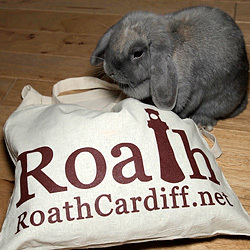 “We’ve been sat in pubs saying ‘Roath should have its own brewery’ for years! We both moved house within a couple of months of each other last year and used that as the opportunity to make sure we found space for brewing. So now we’ve very excited to be launching Roath’s first new brewery in 100 years or more (we think!). “When we first met each other, we quickly discovered a shared love of German beer from the time that we’d both spent living in Germany. We’ve been influenced by that and, between us, time spent living in Yorkshire, the US and on the South Coast – but we’re taking our inspiration from all that’s brilliant about Roath. The pair have worked with local designers Dave Abbott and Matt Needle on the branding and label design and will continue to work with Roath artists on future brews. A refreshingly clean Wit, brewed for the heat of a summer’s day or the spice of a mid-winter curry. Light, citrusy and subtly floral, it’s a wheat beer even people who think they don’t like wheat beer will like. Antarctic Pale Ale will be available on Saturday (27 August) with the others being added in the coming weeks.